What regulates cell fate determination in an embryo? How do cells collectively know when they should form the three embryonic germ layers – ectoderm, mesoderm and endoderm – and later ingress when they undergo epithelial to mesenchymal transition (EMT) and grow to form various organs, for example the gut, muscle or brain? And even before the embryo has implanted in the uterus, what do we understand of how individual cells in the inner cell mass of a blastocyst become pluripotent or know when to differentiate into cells that are then committed to become the embryo itself (epiblast) or the extraembryonic tissues? These were a few of the questions explored at the talks at theInternational Society for Developmental Biology (joint meeting with the British Developmental Biology Society) in November. One answer is signaling and growth factors, for which there are several players, from Nodal (early gastrulation), to Wnt (neural tube formation) to FGFs, and the downstream transcription factors and gene regulatory networks that interpret such signals. T box transcription factors play important roles in embryogenesis, one example being the role of Eomesodermin in gastrulation, as discussed by both Elizabeth Robertson and Fiona Wardle (see also her recent BMC Biology article); and later in neural tube formation, various T box factors are important. Another answer to understanding cell fate determination lies in cell movements. We understand a lot more about EMT at gastrulation – mainly thanks to some elegant quantitive imaging analysis, as presented at the conference by Kat Hajantonakis to trace the origin of cells both pre-implantation and at gastrulation. 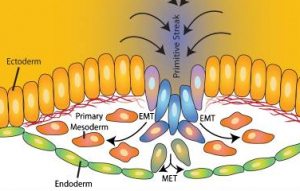 Angela Nieto discussed a phenomenon known as ‘partial EMT’, in which cells lose epithelial markers, have no apical markers and decreased E-cadherin levels, and have more mesenchymal properties, for example such cells can break through the basement membrane, but have not fully ‘transitioned’ to becoming mesenchymal cells. The discovery of cells with such ‘partial’ epithelial/mesenchymal properties may be relevant for several communities: from understanding metastasis to fibrosis and regeneration, as well as understanding early development. In other discussions, Paul Kulea advanced our understanding of cell movements by presenting interesting work on how ‘trail blazer’ cells led neural crest cell migration in a ‘cell-induced gradient model’. James Briscoe gave an elegant account of modeling gene regulatory networks (GRN) that pattern the neural tube, in the context of the positional information that is provided by morphogen gradients, which results in the activation of GRNs. An account of his approach is to be found in an interview just published as part of our new article series Beyond Mendel: Modeling in Biology. These discussions were only a small part of the conference, which encompassed regeneration, evolution, plant development, organogenesis, and stem cell therapy, several of which were represented in the work of the three winners of the poster prize, which BMC Biology was delighted to sponsor. Stoyana Alexandrova presented findings on how the embryo ‘polices’ what cells it incorporates into the embryo itself (by using live imaging of ES cells); Sophie Gilbert examined how the C. eleganshomolog for Caudal, pal-1 affects the cellular migration of stem-like seam cells; and Laurence Lemaireadded new players, BICC1 and HNF6, to understanding NEUROG3+ endocrine cell production and ductal cyst prevention. Our congratulations to all three for their contribution to the understanding of the cellular and molecular details of embryogenesis.